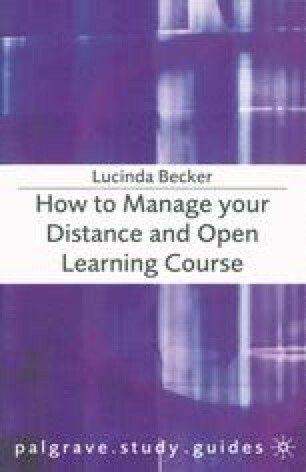 As a distance and open learner you are entering a new way of working. The experience will differ from your working relationship with past tutors at school, college or on campus-based courses, which can be to your benefit, once you have mastered the situation. The learning skills that you will develop on your course, discussed earlier in this book, will help you to move forward as an active learner: your relationship with your tutor needs to be an equally active and rewarding experience. The key is to refuse to see the situation in a negative light. Your tutor is there to facilitate your learning and will have to assess the development of your thought processes on the course, yet you will have limited face-to-face time with your tutor. You do, however, have a host of other means of communication which can be used to your advantage, even if sometimes the methods of tutoring seem unfamiliar, even intrusive, to you. You will not be alone if you find this new way of working strange at first, but taking positive steps at the outset of your course will ensure that the situation becomes familiar within a short space of time. The areas covered below are: telephone contact; group sessions; day school discussions, your developing learning skills; and reducing the sense of distance.